Mild Acne: Comedones: To Treat or Not to? Mild acne, being the commonest type of acne affecting majority of adolescents and teenagers need not be actively treated. The following are a few of the most frequently asked questions on mild acne. Acne is divided into different types depending upon the severity of the eruptions. Mild acne denotes a few eruptions of the comedones, both open and closed varieties. 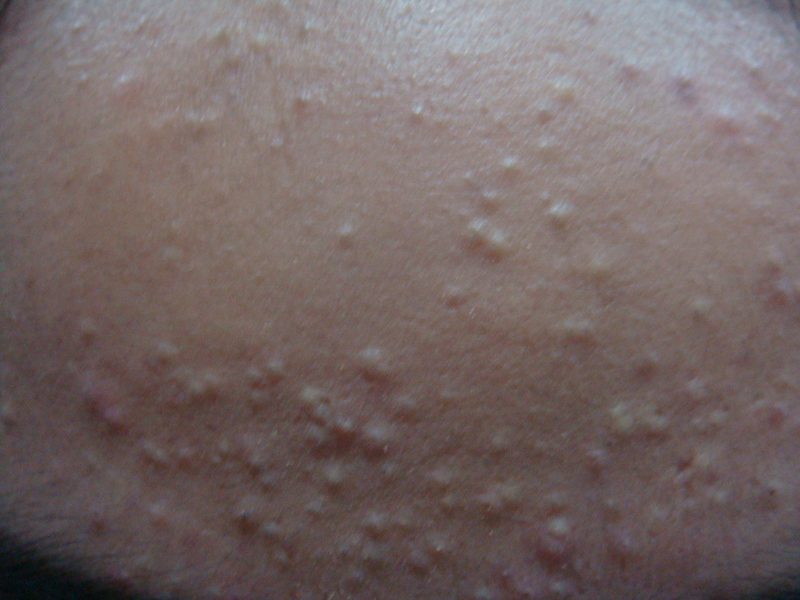 This is the most common type of acne that makes its first appearance in adolescence. Most cases of mild pimples do not require any active treatment and they rarely cause any scarring. How is Mild Acne Formed? The arrival of puberty causes a surge of androgenic hormones in the body. They have specific action on the sebaceous glands, which start secreting thick, sticky oily sebum into the hair follicle ducts. 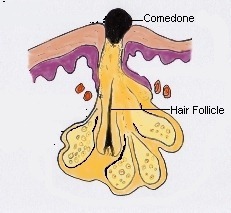 The hormones also act on the lining cells of the follicular wall, which become thickened and keratinous. This cellular debris and the sticky sebum accumulate in the hair follicle duct and form a plug to close the pore. This plug is known as a microcomedone. When the keratinous plug pushes out under a thin layer of the skin, it is known as closed comedone or whitehead. When the opening is open, it widens under the pressure from the plug to form a blackhead or open comedone. 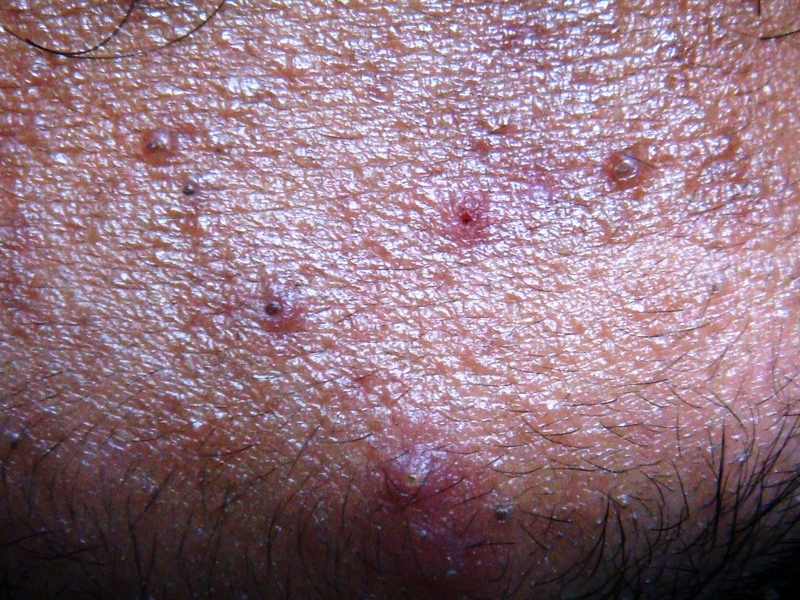 The black color of the blackheads is not due to dirt accumulation, but due the action of oxygen in the atmosphere on the fatty acids of the sebum. What is the Clinical Appearance of a Comedone? Closed comedones or white heads present as skin colored, white or slightly reddish bumps on the facial skin. Open comedones or blackheads have wide rimmed opening with a characteristic black plug covering the opening. This black color is not due to dirt, but caused by oxidization of the sebum when it comes in contact with the atmospheric oxygen. The treatment of mild comedonal acne do not warranty use of oral medications, topical applications will work well in most cases. Does Mild Comedonal Acne Cause Scarring? This is an important question which requires specific clarification, as it may have a bearing in treatment decisions; both by the patient and the physician. Though rare, mild comedonal acne can cause scarring in some affected teens. A family history of acne scars and hard, wide open comedones should prompt the sufferer to seek prompt medical treatment. When Should Mild Acne be Treated? A family history of acne scarring. Large comedones which are hard in consistency are more prone for ice pick scars and should be treated early. The habit of picking at the comedones and squeezing or picking at the blackheads can cause worsening and inflammation of the acne bumps and warrants early treatment. Is it Advisable to Extract the Comedones? Actually, it is not the comedones that are extracted, but the mixture of the oily sebum and the cellular debris blocking the hair duct within the comedones that is being extracted. Clearing the blocked ducts in blackhead will result in faster healing, if done properly. Never squeeze or scrub the comedones, this will worsen the acne and may precipitate an inflammatory reaction resulting in scarring. Do not try to extract contents from a white head or a closed comedone. Breaking of the sebum and debris into the dermis may result in inflammatory acne formation. The procedure should be carried out by an experienced dermatologist or cosmetologist only, with a comedone extractor. How to Treat Mild Acne? Mild acne treatment is carried out through topical applications, topical retinoids being the most preferred agents. Read more about treatment of mild acne.